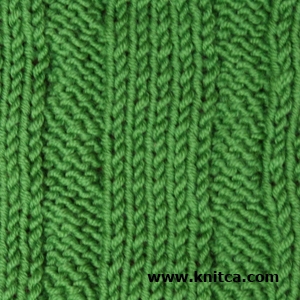 I was looking through some old knitting magazines and saw a sweater made with this interesting stitch pattern. Cables used together with slipped stitches make nice texture. 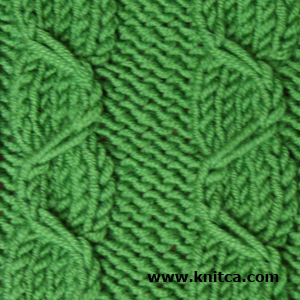 This stitch pattern looks good on both sides and can be used for a shrug or a scarf. It will also look great as a substitute for a 5x5 ribbing on a collar or edge. Cast on a multiple of 10 stitches. Add 2 more selvage stitches if you want to make a nice-looking edge. Row 1 (right side): *purl 3 sts., knit 5 sts, purl 2 sts*, repeat from * to * as necessary. Row 2 (wrong side): *knit 2 sts., purl 5 sts, knit 3 sts*, repeat from * to * as necessary. Row 3 (right side): work as row 1. Row 4 (wrong side): work as row 2. Row 5 (right side): *purl 3 sts., slip 1 stitch knitwise with yarn at back of the work, knit 4 sts, purl 2 sts*, repeat from * to * as necessary. Row 6 (wrong side): *knit 2 sts., purl 4 sts, slip 1 stitch purlwise with yarn in front of the work, knit 3 sts*, repeat from * to * as necessary. Row 7 (right side): *purl 3 sts., slip 1 stitch to a cable needle and hold it to the front of the work, knit 4 stitches, return the slipped stitch to the left needle and knit it, purl 2 sts*, repeat from * to * as necessary. Row 9 (right side): work as row 1. Row 10 (wrong side): work as row 2. Row 11 (right side): *purl 3 sts., knit 4 sts, slip 1 stitch knitwise with yarn at back of the work, purl 2 sts*, repeat from * to * as necessary. Row 12 (wrong side): *knit 2 sts., slip 1 stitch purlwise with yarn in front of the work, purl 4 sts, knit 3 sts*, repeat from * to * as necessary. Row 13 (right side): *purl 3 sts., slip 4 stitches to a cable needle and hold them to the back of the work, knit 1 stitch, return the slipped stitches to the left needle and knit them, purl 2 sts*, repeat from * to * as necessary. Row 14 (wrong side): work as row 2. Row 15 (right side): work as row 1. Row 16 (wrong side): work as row 2. Repeat rows 5-16 as necessary for completing your project. You can also work according to the chart available at http://www.knitca.com/cable2. Pattern repeat is marked by red frame.